Patio Pre-Season Sale Going on Now! Come Celebrate 10 Years of Patio in Rohrerstown! Shop patio furniture and sets at the area’s largest in stock selection of cast aluminum, deep seating cushion, sling, wicker and more. 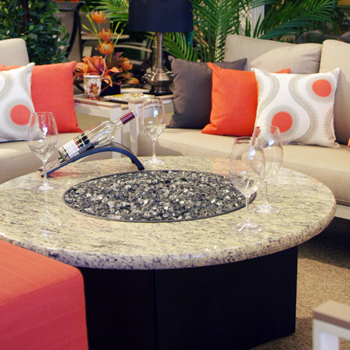 Stauffers’ patio showrooms in Rohrerstown and Mechanicsburg, PA have what you’re looking for! Check Out Our Sets! Read focused blogs all about our patio furniture, selection, decor tips and more. We will delight you with our white-glove delivery service. This includes unpacking, removal/disposal of packing materials and placing your furniture where you will enjoy it. Frame & fabric. We’d be delighted to help you make your selections. Stay cool with umbrellas in a variety of colors and style options. Our outdoor designers will make your dreams a reality! We listen to what you want and then design & create an outdoor living space perfect for relaxation and entertining so that you can enjoy your own private paradise. Little touches of color and personality can be added to your outdoor living space with cups, plates, and more! Each Telescope table is made in the USA and can be easily converted from burner back to coffee table. Mix and match your aluminum frame and Marine Grade Polymer colors to create exciting new looks. We also offer Oriflamme tables which are created by an artisan who sought to capture and share the essence of fire. Available in rectangular, square, round, and oval shapes. Great for indoors or outdoors. Both affordable and fashionable plus inherently stain resistant.